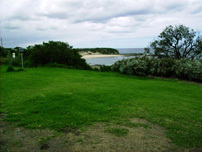 Kilcunda Oceanview also boasts some of the best camping views available anywhere. 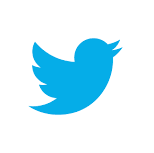 Caravanners, motorhomes and campers all welcome. 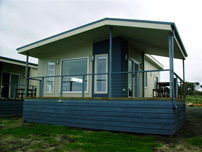 Ask about our new Oceanview Cottage. 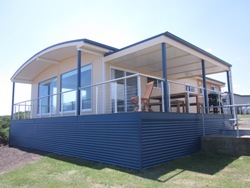 Luxuriously appointed with 3 bedrooms, all linen, ensuite to main bedroom, family bathroom with spa bath, pebble gas fire, hostess kitchen, heaps of relaxation space, huge deck with BBQ & absolutely spectacular views to Phillip Island and Bass Strait from huge picture windows. Spectacular uninterrupted views of Bass Strait are beautifully accompanied by our well equipped Villas that accommodate up to six guests. Each Villa has 2 bedrooms, main QS bed, open plan lounge area, fully equipped kitchen, modern bathroom with excellent facilities such as rev cycle aircon, ceiling fans, LCD TVs in lounge and main bedroom, fantastic gated deck and outdoor setting. 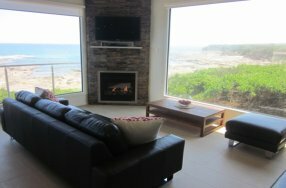 Ask about our luxury Oceanfront Villas with pebble gas fire, larger picture window & more. 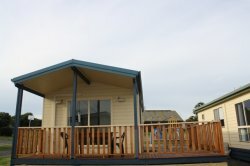 Our deluxe cabins offer our guests a large open plan living area, 2 bedrooms, bathroom, fully equipped kitchen, TV & DVD player, large deck, oceanviews & more. 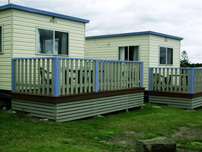 Ideal family holiday accommodation. 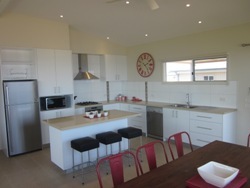 Provide comfortable accommodation with well equipped kitchen, bathroom & lounge area with TV, large deck. Main bed made up with linen & towels. Freshly updated Guest amenities & laundry.